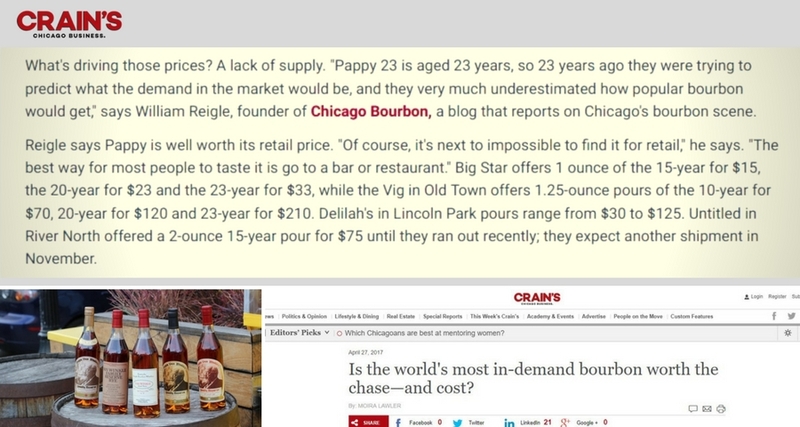 Chicago Bourbon, established in 2015, is a blog devoted to reviewing, touring, tasting, and reporting on Chicago’s growing bourbon community. We aim to offer exclusive tasting, sharing, and collecting opportunities. As well as one of a kind bourbon focused events, tours, education, and travel. Chicago native William Reigle founded Chicago Bourbon. After receiving a traditional education in the technology field he graduated to immersing himself in America’s Spirit, Bourbon Whiskey. Through many drives down to Kentucky, chance encounters at bourbon hangouts, and the most friendly and open industry people around, Chicago Bourbon was born. William has continued his bourbon education by obtaining Louisville’s Stave & Thief Society’s ‘Executive Bourbon Steward’ certification. William, and Chicago Bourbon’s contributors, share their bourbon experience through consulting engagements, hosted bourbon tastings, the blog, and social media. Add a unique bourbon tasting to your next corporate event, conference happy hour, or party. Fill out the form below and we’ll get back to you right away! William Reigle interviewed by Crain’s Chicago Business! Read more: Is the world’s most in-demand bourbon worth the chase—and cost?